LIVE: President Mugabe addresses the nation . 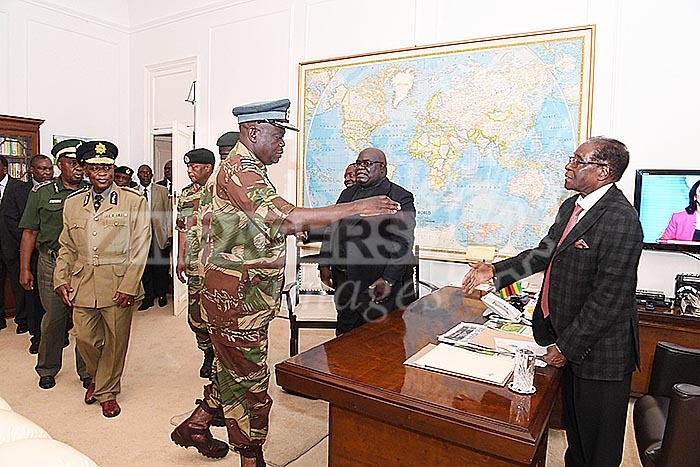 . .
Air Marshal Perence Shiri Commander Airforce of Zimbabwe greets President Robert Mugabe while Roman Catholic Priest Father Fidelis Mukonori looks on. Air Marshal Perence Shiri Commander Airforce of Zimbabwe greets President Robert Mugabe while Roman Catholic Priest Father Fidelis Mukonori looks on at State House, 19 November 2017. Stay logged in for President Mugabe’s address to the nation. The Generals are already seated waiting for President Mugabe’s address. 20:00– The Generals are back at State House now. The address is about to start. 20:50– The generals have gone into a closed meeting with the President. 20:57 – Also present are Father Mukonori, Dr Misheck Sibanda, Mr George Charamba and Rtd Brigadier General Happyton Bonyongwe. 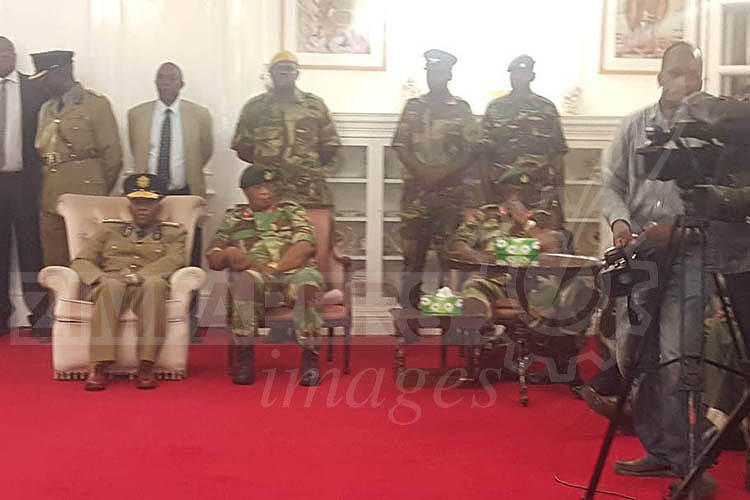 President Mugabe acknowledges the concerns raised by the Generals regarding the state of the party and nation. He also says the action taken was not a threat to constitutional order or my authority as President. 21:11 – A few incidents may have occurred but these have been corrected . State institutions remained functiona. Among other issues discussed is that relating to the economy which is going through a difficult path. President Mugabe also says of greater concern from Commanders is that lack of unity in party and get was translating to the economy. 21:14 – Flagship projects are stagnant and this must stop . He says. We are a nation born out of struggle. We still have in our communities veterans of the struggle. 21:17 – There has to be a net return to our guiding principles and the era of victimization and arbitrary victimization should stop. 21:20 – I am aware that many developments have happened in the party. Given failing of the past, such developments are understandable. We can not be guided by vengefulness. 21:21 – Our policy of reconciliation we pronounced in 1980 cannot be unavailable to our own both in party and nation. I am confident that from tonight we move forward reminding our wartime mantra iwe neni tine basa.